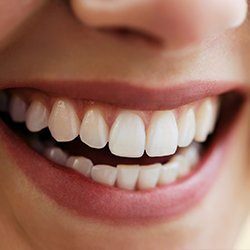 Even healthy teeth can sometimes develop noticeable aesthetic flaws like stains, chips, cracks, and gaps, leading people to feel self-conscious and hide their smiles at every opportunity. However, these issues don’t have to be permanent! With the cosmetic treatments detailed below, we can take anything that is bothering you about your teeth and make it practically disappear, often in just one or two appointments. In the end, the big, bright, and beautiful grin you’ve always wanted will be there to greet you in the mirror every morning. Sound too good to be true? Give us a call today to learn about your cosmetic options! Why Choose Beach Dental for Cosmetic Dentistry? If you’ve ever watched a movie or TV and thought, “How are their teeth that perfect? !” you were most likely looking at porcelain veneers. 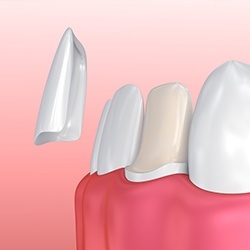 For this treatment, extremely thin ceramic shells are fitted over the front of the teeth, enabling a patient to change their shape, size, and color to whatever they want. 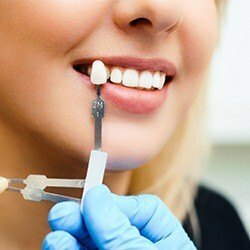 In just two appointments, veneers can fix a wide array of imperfections at the same time, including stubborn stains, dental damage, and even noticeable gaps. Metal-free restorations are made of high-quality dental porcelain, and they enable our team to recreate the look and strength of natural enamel perfectly. Using this material, we can fully repair a tooth and bring back its original appearance at the same time, which is ideal for damaged teeth that show prominently in the smile. Even better, using same day crown technology, we can often provide a custom-made porcelain restoration in just one appointment! In the world of teeth whitening, there is KOR Deep Bleaching, and then there is every other treatment. KOR uses a unique approach and high-quality ingredients that are able to remove many kinds of dental stains that other gels and strips leave behind. In addition to eliminating coffee, wine, tea, and tobacco stains, KOR can also tackle discoloration due to certain medications (specifically tetracycline). If you’re looking to get the kind of smile that always lights up the room, KOR is your answer. After we’ve made your teeth look as beautiful as they can, we can then help you get rid of annoying fine lines and wrinkles on your face using two of the most trusted treatments in the world. Our team has taken advanced training on how to effectively use Botox and Juvederm, meaning we can give you the perfect smile and a more youthful-looking face all at the same appointment. Now, you can save time and money by not having to visit the spa!